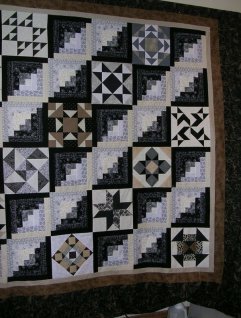 Take a look at what we did for our Saturday Sampler class in 2012. 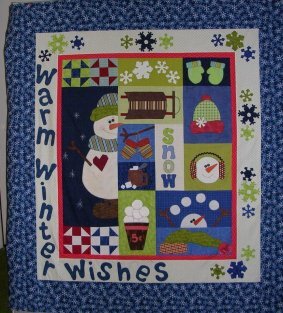 Here is the finished "Let It Snow" applique quilt . . . .
and the pieced blocks in the "neutrals" color way . . .
We would like to invite you to attend Saturday Sampler 2013. It will begin Saturday, January 12, at 8:00 a.m., 9:00 am., or 10:00 a.m. Pay a $10.00 fee the first month (this covers not only your first block, but all the paper patterns we give throughout the year) sit through our short class, go home and make your block, return next month and recieve the next block free. As long as you continue to attend with your finished block, the next block is free. If you need to miss, you may jump back in at any time for $7.00. We have been working overtime to create three fabulous new quilts for this coming year. There should be something for everyone! Mark your calendar and spend an hour with us on Saturday, January 12. If you can't make it that day, you may come in any time throughout the next month to purchase your first block. Also, sign up for our All Nighter class on Friday, January 18 at 6:00 p.m. This is a popular class, bring a favorite treat or covered dish and spend as long as you like sewing on anything of your choice. It's a nice way to spend some a little creative time with other lovely ladies!